Do you identify on the Trans* spectrum and/or are you questioning your gender identity? 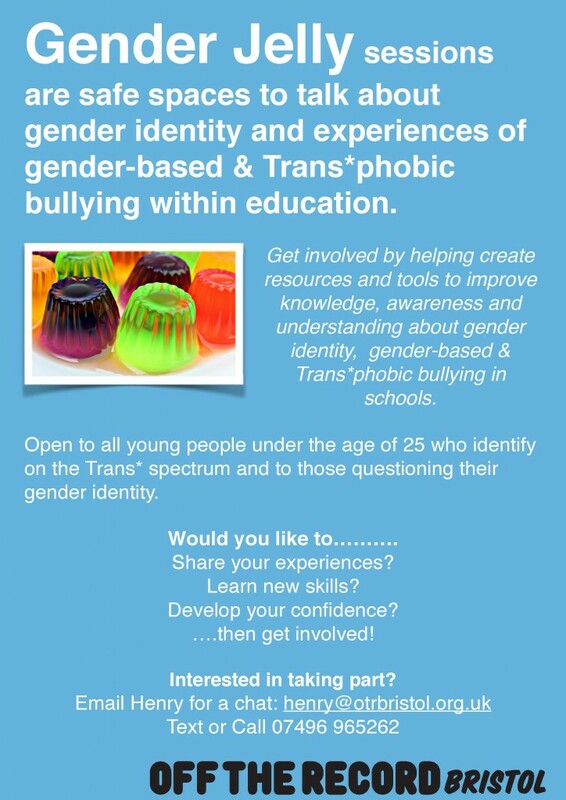 The Gender Jelly project will be designing new and exciting resources about gender identity, Trans* identities and how to tackle Trans*phobic bullying in schools. Get your voice heard and make a change by getting involved! ProjecTeers will have input into the content and look of the resources that we will create to support teachers and young people in having conversations about gender identity, Trans* identity and Trans*phobic bullying. – Photography project where you will have the chance to create bold images about gender and what it means to you. – Creative arts session (poetry, creative writing, illustration, spoken word, art journalling… and more) which will be an opportunity to start your conversation about gender through art. Email Henry for a chat about getting involved and to find out times and dates for the sessions. Sessions will be held in a central Bristol location and travel can be paid.